Gutter Helmet is part of your roof protection system. Whether you're installing solar shingles or solar panels, you want to protect your investment and prevent water from backing up onto your roof. Gutter Helmet works to prevent damage to your solar roof. If I have no trees, do I need Gutter Helmet? If you don't have trees around your home, you may still need Gutter Helmet. If there is debris in your gutters, you need Gutter Helmet. Even without trees in your yard, blossoms and leaves from your neighbors' gardens can accumulate in your gutters. Fine debris from pollen, needles and decaying roof shingles also moves down into your gutters. Small animals such as wasps will still enjoy nesting in your gutters, no matter whether you have trees or not. It just makes sense to protect your gutters. I have oversized 6" K-style gutters on my house. Will Gutter Helmet work? Many U.S. homes have K-style gutters since these gutters give an attractive, finished look to a home. Since they have more rounded areas inside the gutters, debris can easily accumulate, and these gutters are harder to clean. Gutter Helmet works with many different types of gutters to ensure that you have the protection you need for your gutter system. Harry Helmet prevents birds, squirrels, and ants from nesting in your home. How does Gutter Helmet prevent carpenter ants from breeding in my gutters? What is a nose forward design? Is it important? You put your best foot forward. Gutter Helmet puts its nose forward. With a nose forward design, you know that leaves and other debris will slide right off the end of your gutter covers. That's because the end extends beyond the rest of the gutter. Debris simply can't slide into the gutter anymore, and instead, it falls to the ground. Can Gutter Helmet stop squirrels and birds from nesting in my gutters? What does triple lifetime warranty mean? If cats have nine lives, does this mean your gutter guards have three? Not quite: our outstanding triple lifetime warranty means that you're protected for life in three different ways. When you purchase Gutter Helmet products, you're covered against defective materials and workmanship. 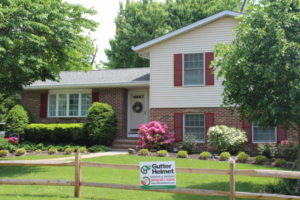 Your gutters are guaranteed for performance as well. Finally, these warranties are transferable, so the next homeowner will be just as pleased as you are with our product. I have trouble with water running between my gutter and the fascia board. Can Gutter Helmet prevent this?